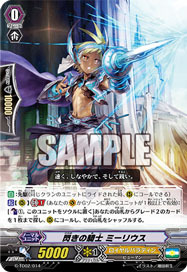 [A]: [Counterblast: (2)] When this is placed to (V) or (R), if you have a ::Gold PAladin:: Vanguard, you may pay cost. If so, search your Library for up to 1 Grade 0 ::Gold Paladin:: Normal Unit and call it to (R). Shuffle your Library. The protectors of the legendary ruins are the Guardian Sacred Beasts.